Well....they really aren't my horses, but they live at the end of our cul-de-sac. A few months ago we started to take carrots to Lucky the goat on our walks. One day we walked by these guys and I just so happened to have some extra carrots with me. Handsome (the dark brown one) was right by the fence. I figured I'd see if he wanted a carrot, too. He sure did. Pretty (the tan one) wasn't so sure of us at that point. She hung out in a side pasture and didn't have any interest in coming over and seeing us. Handsome on the other hand is a ham. He loves snuggling his head into you and licking your hand hoping for some hidden carrots in there. Our first few visits he would gallop away full of excitement or run over and tell Pretty about the carrot he just got. Often when we are coming and going from the house I'll see him out in the field rolling around on his back. Adalyn trying to give Pretty a carrot from the backpack. Adalyn was nervous about these guys at first, but now she loves them and knows what I am talking about when I mention the horses. Just in the last few weeks Pretty has started to come over and see us. Each visit she has gotten more and more friendly and comfortable. This last time she stayed so we could pet her. Some times they'll be hanging out in the barn when we walk by and as of late have even started coming out from there to see us (or me, since Handsome loves me, too). Recently, Handsome was in an adjoining pasture and he came galloping over to get to us. Have I mentioned I love him? We don't know who owns these awesome animals or what their real names are. They live in a communal field for the group of homes across from where we live. They are covered in mud and need some TLC in my opinion. They are never ridden and maybe once a year I have seen a couple little girls in there petting them. Regardless of all of that my days are brighter when I get to go see my horses. Shane: I am excited to go to school today. Me: We'll leave in just about 30 minutes. I am very excited and happy you want to leave for school. There was not a single tear shed at school when I dropped him off. No whining or fussing about going there. No anxiety at all. This is a HUGE step for Shane. The struggles we have gone through with his anxiety towards the outside world have been rough on all of us. This may seem like such a small thing to most kids or parents, but it is enormous in the world of Shane. I just hope Wednesday morning he feels the same way. 1. Preheat the oven to 500 degrees. In a small saucepan, over medium heat, stir together the water, ketchup, brown sugar, vinegar, lemon juice and Worcestershire sauce. Season with salt, mustard powder and chili powder. Simmer the sauce for 15 minutes. 2. Place the chicken thighs into a baking dish and pour the sauce over them. Cover tightly. 3. Bake for 15 minutes in the preheated oven, then reduce the temperature to 300 degrees and bake for one hour. Remove cover, stir and bake uncovered for 15 minutes. Saturday -- Easy Cashew Chicken with Coconut Rice (I really want to try this, but am slightly nervous about it...let's see if I still have the courage come Saturday). February is coming to an end. Can you believe it? Where does the time go. Last week I was playing around with my CTMH February Stamp of the Month Thoughtful Tidings. There are a bunch of images you can use with the CTMH Circut cartridge Art Philosophy. It's funny how you like a stamp set so much more when you start to use it. I love 3x3 cards. I just couldn't help make a couple with this set. You can get your very own Thoughtful Tidings stamp set when you purchase $50 worth of CTMH products. 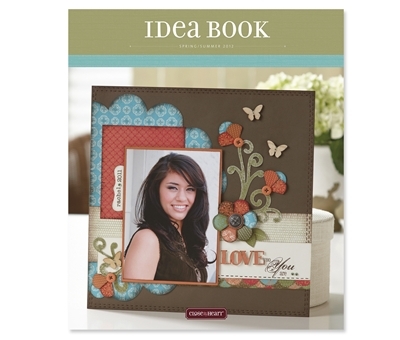 Take advantage of this months Studio J special AND get this stamp set for just $5! Have you noticed all those little bulbs popping up from the ground. I get so excited to see them because it means spring is just around the corner. Good bye winter!!! Wednesday, March 14th at 7pm we'll be making this sweet bloom banner. Perfect for decorating your house for spring time. Cost: $10 All you need to bring is your adhesive. Be ready for a fun evening of laughter and girl talk. Adalyn got sick last weekend and it wasn't pretty. She had been teething the couple weeks before this all happened, so the ickiness of teething rolled into even more ickiness of being sick. Luckily for us, Shane was in Sequim for the weekend which made dealing with a sad, cranky, feverish, not sleeping or eating, running/stuffy nose, sneezing, coughing and throwing up toddler a lot easier. A pediatric dentist who had undergone dental hygienist training can advise you on ways to sooth your teething baby. But of course when you've been snuggling, wiping and sleeping with this little sick girl.....it's means you are going to get sick, too. Which I did on Monday. No amount of vitamin C or zinc could keep me from getting sick. The hardest part of Adalyn being sick was her sleeping. Or I should say her NOT sleeping. Four days in a row she went to sleep at 6pm and slept for 2 hours. Then she would wake up at 8pm and not go back to sleep until 10-11pm! Two of those nights she ended up sleeping with me, which she has NEVER done before. Which then meant I didn't sleep next to a snoring wiggly kiddo. Last night she slept through the night. If you are keeping track that was just the 3rd time in her whole life she has EVER done that. Not once did she wake up or need a "fix". Amazing. I certainly needed that. She still isn't eating much and basically surviving on milk. She has a very delicate gag reflex. I feel like she is scared to each much of anything because it makes her gag still. We have an appointment with the Children's Hospital Sleep Clinic in a couple weeks. Even on a "good" night Adalyn is up 2-3 times a night still. I still have hopes that some day my youngest child will sleep through the night. I am ADDICTED to these yummy little things! I can't get enough of them. No one else will eat them in my house (it's a texture thing). I've now made them twice and when they are all gone I dream about making more. They make up super fast and you may just have all the ingredients on hand right now. Pastry schools should also be able to teach you how to make a no bake fruit and nut energy bites. Roll them into little balls (1-2 inches in size) and put them into a dish. Chill in the fridge for 30-60 minutes (the colder they are the better they taste). After they are chilled they are ready to be eaten. I literally survived on these yummy little things for days. I just would pop one in mouth for breakfast, snack or lunch. I need to go make some more!!! Adalyn was sick all weekend and now I feel myself starting to get sick. We'll see how the menu holds up for the week. I need to get to the grocery store to make most of these meals happen. Thursday -- leftovers (I hope to have dinner out with my Mom's Group). It feels like we have an infant in the house right now. I am getting about as much sleep as I did when Adalyn was 1-4 months old. She is teething yet again and this round is NOT going well. She isn't eating or sleeping well during the day or at night. Last night she was up every half an hour until midnight. Then again at 3am and refused to go back to sleep around 4:30. I am so tired my mind won't think straight and it gets easily overwhelmed. My email account was hacked into yesterday and then my email was taken over by hotmail due to said hacker. In a normal mind set that may not be a big deal, but right now I just want to scream. We have a babysitter for tonight. Shane is going to be in Sequim for the weekend. We made plans with another couple to go to the movies. It was difficult but we settled on a movie and a time. This morning the time had been changed. Really....not want I needed to deal with today. I am just plain to tired. Sleep....more sleep would make this all go a lot more smoothly. I know Addie doesn't feel well and that she is uncomfortable. I feel bad for her. I feel bad for all of us. Please, God, can my 15 month old pop these teeth through ASAP and start sleeping through the night for all of our sakes! Phases....I go through a lot of phases in my life and right now I am on a Close To My Heart Challenge phase. 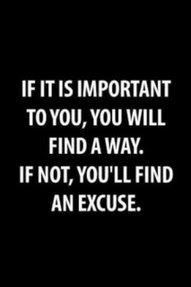 I am determined to "win" a get-away weekend. In this phase I am creating, scrapbooking, organizing and connecting/contacting with my CTMH customers. 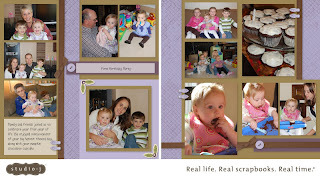 I go through phases where all I want to do is bake or cook, read a book, sew something, clean or organize, blog. Sometimes I even have a phase when I don't want to do anything. My current phase isn't leaving much time for anything else beyond "normal" life of kids/family/house. The blog seems to be taking the biggest hit of all. Stick with me through this phase. I have a long list of things I'd love to post about....I just need to find myself more time to do so. Shane and I made some valentine's together this past week to send out to a handful of friends and family. First we made these cute Valentine Hugs that we sent to the Grandparents. I was even able to get Adalyn to sit still so I could paint her hands. Then we used 3 12x12 pieces of cardstock and put a bunch of paint in the middle and folded the paper over. When we unfolded the paper we got cool designs (I know this technique has a name, but I can't think of it). Then I cut the paper out into heart shapes. Shane has been working on writing his name, so this gave him good practice on signing it on the back of each one. 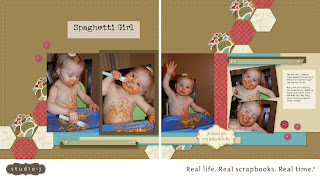 Quick, easy, cheap and cute = the perfect preschooler/toddler activity. I am hoping to not have to go to the grocery store this week, which means I really have to work out of the freezer and pantry and make it all work with what we have on hand. Our meals won't be very creative, but we'll still eat. With the Five For Free special that Close To My Heart in February. 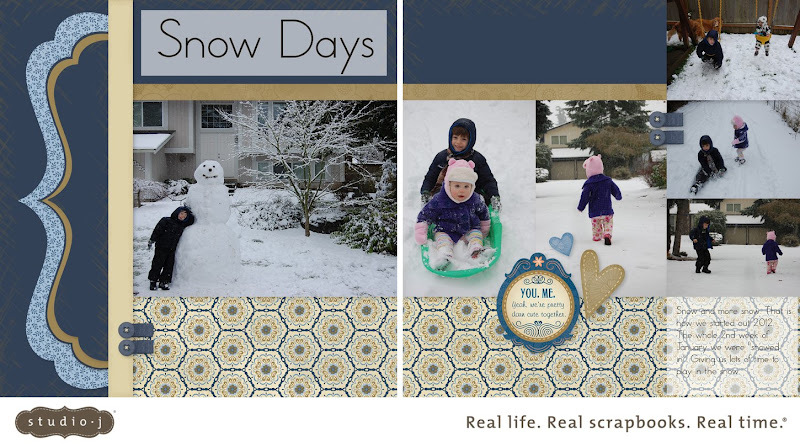 I sat down and knocked out some layouts using Studio J this week. 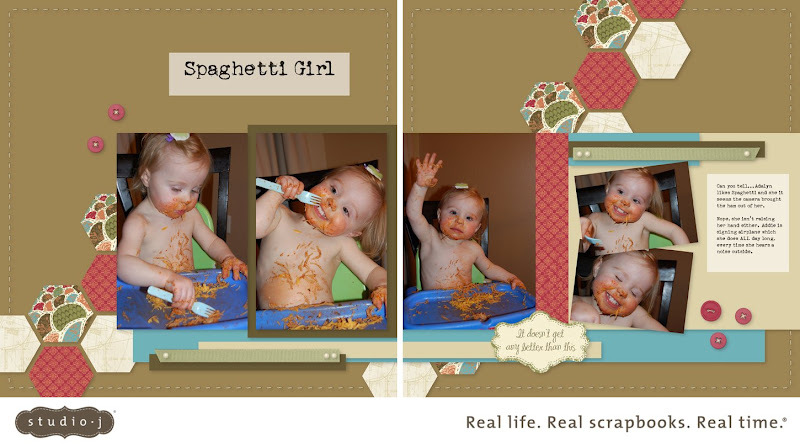 I had forgotten how much I love scrapbooking with Studio J and how accomplished I feel afterwards. My Close To My Heart team is having a little challenge the next two months. If we earn enough points we get a mini-retreat to Leavenworth. My eyes are very much set on that prize. One of our tasks this week was to create a card using new paper from the Spring/Summer Idea Book. I was inspired by this card. I had a friend ask me if I could show her how to make the blocks like the JOY ones I did for Christmas. It was a fantastic excuse to make some LOVE blocks for Valentine's Day. I used Close To My Heart retired paper called Sweetheart. I cut the letters out from my CTMH Art Philosophy Cricut Cartiridge and embellished using random items I had laying around from CTMH. The black ribbon is from Micheal's. My wonderful Husband cut out the blocks for this project (6, 7, 8 and 9 inches). As soon as Valentine's Day is over, I'll be all ready for St. Patrick's Day. This paper is not from CTMH, but all the embellishments are. Are you behind on your scrapbooking? 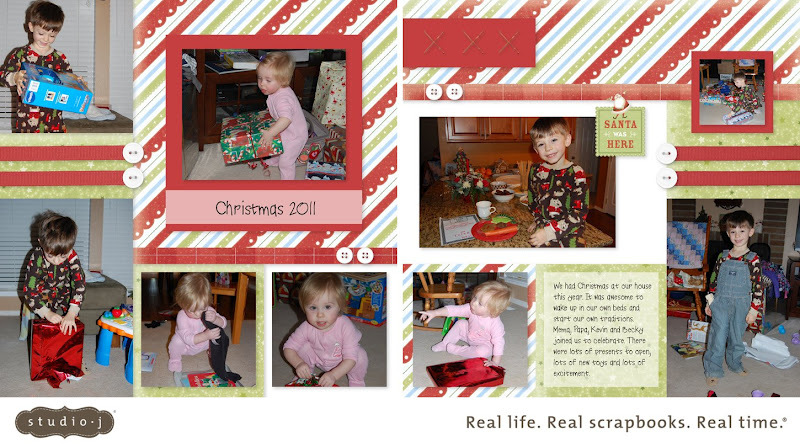 Have you been wanting to try digital scrapbooking? Have you already fallen in love with Studio J? If you answered yes to any of those questions then this month's CTMH special is just for you. 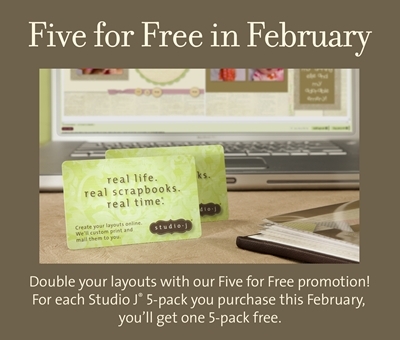 For each Studio J 5-pack you purchase in February you'll get one FREE 5-pack. That means you get 10 layouts for just $55...just $2.75 per page. You even get FREE shipping! Even if you are already a Studio J member, you'll save even more when you take advantage of this months deal. Visit my MyCTMH to contact me or place your order. I am pretty sure that I can blame the extra pounds I gained last week to Pinterest. We ate some yummy, yummy food last week thanks to Pinterest. Then I went and got us a bread machine over the weekend. That just screams a few extra pound,s too. But at least those pounds will be warm and homemade! 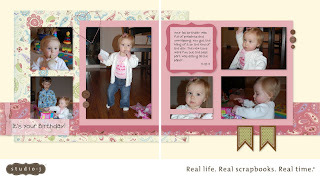 The new Close To My Heart Spring/Summer Idea Book is here! Full of awesome new products and cute paper packets. You can view all of the wonderful new items that CTMH has to offer online here. Attend one of my workshops and take and new Idea Book home with you for FREE. That way you can drool all over the pages and make your wish list all cozy on your couch. I had these 2x2 blocks hanging out in my never used craft supply box. One night in bed I had a vision of decorating them for Valentine's Day. I used an older paper packet from CTMH called Sweetheart, along with some left over chipboard letters. The whole project didn't take long to make. The hardest part was sitting down and ordering pictures and picking them up.